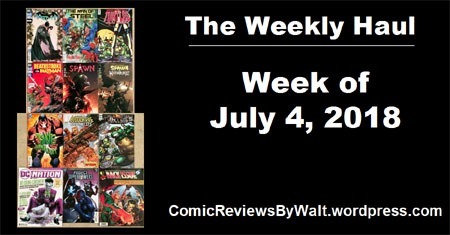 Last week was an odd week for comics, with a US holiday being on Wednesday itself…and with both Marvel AND DC putting out key books on the day, many comic shops opened for limited hours so as to accommodate making sure people could buy the Wedding issue of Batman as well as the premieres of the new Catwoman and Captain America series, among other things. I had a mix of stuff, making it to two shops, amidst a couple of other things going on. I was doing my darnedest to avoid SPOILERS for Batman, and while I technically succeeded…I saw ENOUGH to have a PRETTY STRONG GUESS as to what happened, though I still hoped I was wrong. I ended up buying the issue digitally so I could read it before 1am, and thus be "safe" with spoilers I knew were out there. Suffice it to say that I opted NOT to buy Catwoman. The new Man of Steel mini had its final issue–and I really feel like this SHOULD HAVE BEEN simply the first three issues of the new Superman and 1001-1003 of Action Comics with Bendis. I just don’t see the "specialness" to it that warranted this as a mini-series…we have a new villain, major developments…but nothing to the LEVEL OF the John Byrne stuff. I’m quite enjoying the TMNT: Urban Legends, reprinting the Image run of the TMNT book in color. While I know Peter Laird retained some publishing rights to his own series when he sold the property…given we’ve seen some IDW reprints of the Tales of the TMNT run from the 2001+ era, I hope we might also eventually get colorized reprints of his TMNT vol. 4…perhaps even some sort of finishing of the story that trailed off around 2007. 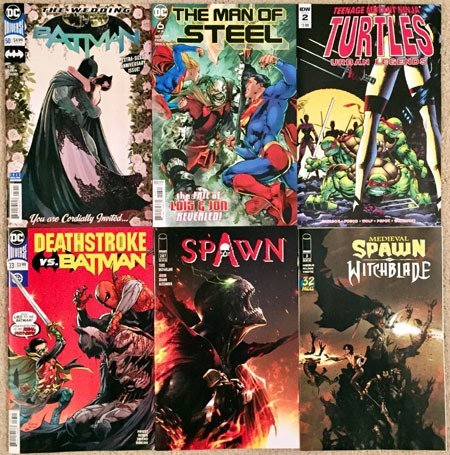 I need to catch up on my reading of Spawn, though being "on" the title since #256 or so, I’m probably still on at least to #300. Of course, a jump from $2.99 to $3.99 might have me reconsidering that. And as much as I like Priest, I have yet to actually read any of the Deathstroke vs. Batman issues, and as I’m easing out of DC, as this arc wraps, I’ll probably be off the title. Bane: Conquest finally gets to its 12th issue. I can’t even honestly remember at this point if I read the first issue last year with stuff going on in my personal life–but the intent was always there, so I stuck with the title. Now by the time I get around to gathering all 12 issues together AND actually reading, I should have waited for the collected volume. The sheer audacity of this The Pouch character got me for Bloodstrike: Brutalists. I have had zero luck finding concrete info as to whether this Brutalists numbering is continuing from the 1990s’ numbering or a more recent numbering. If the latter, I may jump in; otherwise, might go for a collected edition. TMNT Universe is another I have to catch up on reading…though being TMNT, it’s an exception to most of my usual problems with comics and gets that "pass" on its over-pricing. 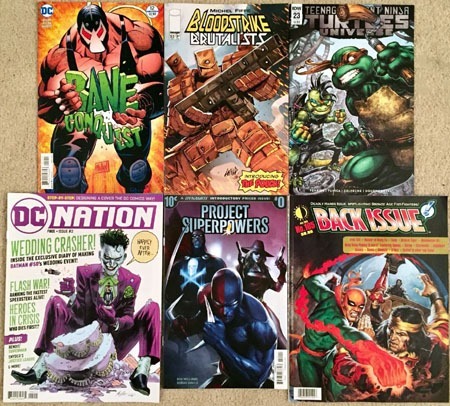 Then we have the newest DC Nation issue; a 10-cent Project Superpowers issue, and another Back Issue issue caught my eye. 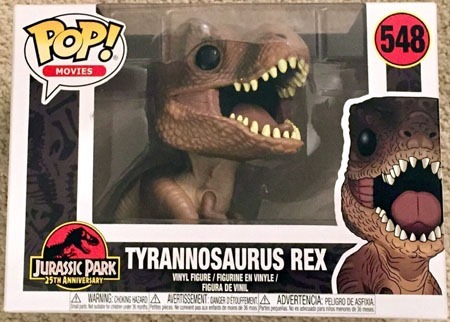 With plans to catch Ant-Man and the Wasp, and known traffic issues with my route, I built a lot of extra time into things on Friday and made it to a Booksamillion I hadn’t been to in awhile, and managed to get this Tyrannosaurus Rex Pop that I passed on some time back and regretted doing so. I thought about getting the Velociraptor but ultimately passed on it due to other books (see further below) and a few other factors for present. I continue to notice that I love these figures for non-human-face characters. They’re excellent for the style…but the human characters/faces just look too generic for my taste. I stopped in at The Exchange, a location of which I hadn’t been to in awhile…and had a 3-way excellent find! 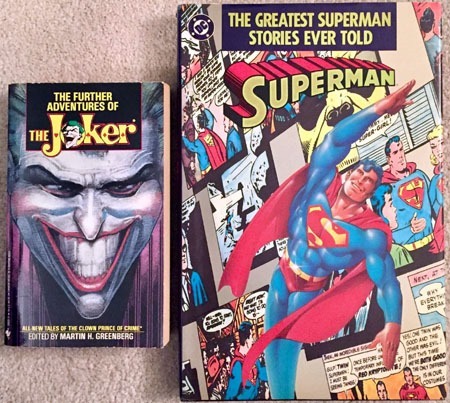 Some years back, a friend had found a copy of this The Further Adventures of the Joker book for me…though in regrettably poor condition. Still, it was the only copy of the thing I’d ever seen or come across. But here, I found one in much better condition, and for 25% cheaper than a standard Marvel comic! I’d been vaguely aware THAT there was a hardcover edition of The Greatest Superman Stories Ever Told, but finding it for $10–half the price of the PAPERback edition–and in relatively decent shape, and it being Superman…I snagged it, as I know full well I’d have totally regretted it if I didn’t and missed out. This is now shelved next to my original paperback copy (that I received as a Christmas gift in 1989…my first-ever TPB/graphic novel/collected edition). 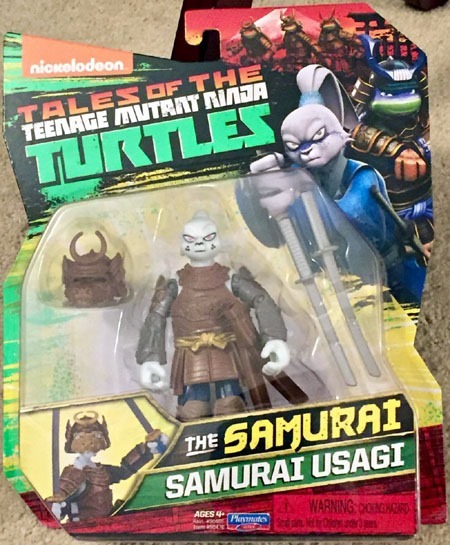 The Exchange also had this Samurai Usagi figure. I don’t’ recall if I’d actually ever seen this "in the wild" or not–I’d seen a couple of the regular version, and bought one of those at the time–but seeing this for only $10 (basically a $2ish premium over Target or Walmart before they prematurely clearanced the line out completely) I jumped on it. Along with the Jurassic Park Pop, the Booksamillion also actually had The Son of Neptune with the other bargain-priced volumes. I’d been eyeing these for quite awhile, but saw no point in buying the hardbacks for vols 3+ without owning vol. 2…and having bought vol. 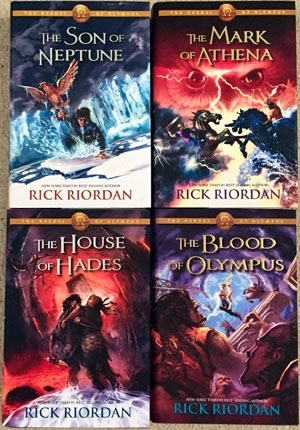 1 in hardback when it first came out (whenever that was now) I wanted the hardbacks instead of the paperbacks. So finding vols 2-5, I sucked it up and spent the money to get these. The next challenge will be actually getting around to–you guessed it–reading them. And speaking of "challenge" and "reading" as a singular thing… Sarah-cat here has really gotten consistent with inserting herself into things whenever I’m trying to read OR take photos for this blog… but she’s so darned cute, and I’d always loved spotlighting Ziggy as well as Chloe along with comics and such, I can’t be annoyed with her. Especially when I can get her to actually look at the camera like this! But as I posted on Twitter when I sent this photo out…it’s safe to assume that any photos in this blog have passed her inspection, as I can’t seem to take any without her being on-hand to supervise. Chloe is often nearby as well, though she seems to have delegated to Sarah, which means between both of them, this blog is 100% kitty-approved! 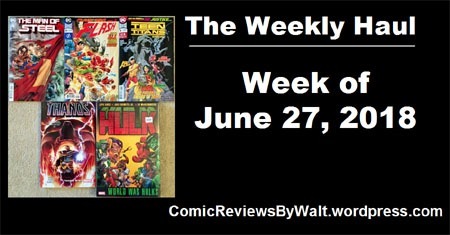 This week’s proved to be a rather small (though more expensive for its size) week. The new Man of Steel issue…which, while it has a nostalgia-inducing cover evoking the nearly-26-year-old Doomsday / The Death of Superman story doesn’t so much as mention or touch on that story whatsoever. Flash 49, part 3 of The Flash War. And due to "hype" I snagged the Teen Titans Special…while it may be a bit of a turning point, I do NOT feel like it lived up to any of the hype at all. Marvel has stupid-ridiculous prices for its single issues and collected volumes. But 6 $3.99 issues and 1 $4.99 issue in a $19.99 paperback is (comparatively) not bad. So I went ahead and got the Thanos Wins tpb. I suppose it’s also a way to support this straight to PAPERBACK thing, rather than going to hardcover first and THEN "eventually" paperback. ORRRRRR I flat-out missed the hardback, so…whatever. Then because it was on sale, I picked up Hulk: World War Hulks for a whopping $5.99. Something like this–a deluxe/oversized hardcover, good and thick…for basically the price of a single Marvel issue? I’m there. It’s also helpful finally updating my phone’s photos-of-my-shelves inventory so that I could look and confirm this wasn’t a duplicate, as I recognized the cover. But that’d be because half the cover is from Fall of the Hulks: Alpha that I reviewed some years back..
Next week will be ‘interesting’ with New Comics Day being July 4th…or Independence Day here in the U.S. and stores being open due to DC and Marvel putting out key issues that’ve been highly hyped, and no one shifted to this past week or July 11th, and Diamond didn’t push by a day for stuff to be on sale on Tuesday or held til Thursday. This was a mixed week, and included a rather unexpected purchase on my part! For one thing, I seem to have missed Executive Assistant Iris from Aspen twice. And where I’d meant to get the new issue of that, I actually bought the new Fathom #1 instead, because of getting the 25-cent Primer. Then there’s X-Men Gold #30. I haven’t touched the series since #1, and had zero intent to–even with the wedding in question. But I’d discovered a major spoiler on Bleeding Cool that made me decide I very definitely wanted to get this issue. This doubles in the unexpected category for the cover: this is an extremely RARE example of my opting to buy a variant over a standard cover. Given the spoiler, it’s this bagged variant that has the image that I wanted. I may well talk about the issue later, but not passing the spoiler along for now. 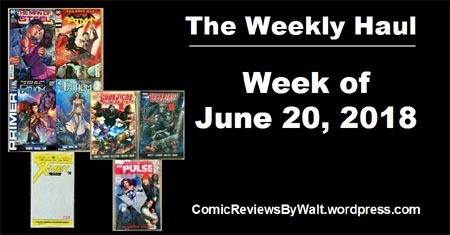 Then there’s the new Man of Steel and Batman issues for the week…getting us ever closer to the end of Man of Steel and the return of ongoing Action Comics and Superman titles, and leaving us with the very next issue of Batman being the 50th…and "the wedding issue." I also opted to partake in a sale, with three $34.99-cover-priced books for $6 apiece. I don’t do much Marvel these days, but for this sort of pricing, and the material in question…very much worth it, ESPECIALLY considering each was a mere $1 more than a standard Marvel #1 issue. Nothing huge beyond that…definitely a simple-ish week! Next week looks to be a bit bigger…hopefully not in a major sticker-shock sort of way! This week’s haul is a rather large one–at least for lately! The latest Man of Steel issue; the 2nd chapter of Flash War (Read Blake Petit‘s review of that over at ForgedBy4! 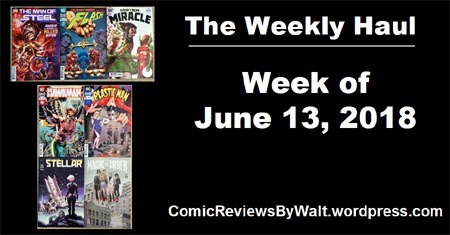 ), and the latest issue of Mister Miracle. Against better judgment and preference, I went ahead and grabbed Hawkman #1, just to "try." Same for Plastic Man #1. 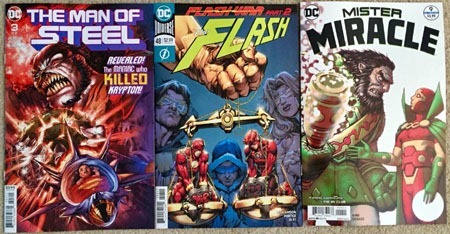 I’m trying to avoid mini-series from DC lately and in general, but something to it had gotten my attention and I figured with getting various other #1s as well, why not? 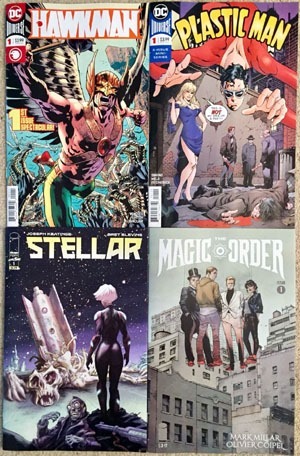 Giving in to the "hype" I’d pretty much decided to check out The Magic Order; and I think I’d seen something about a premise to Stellar #1 and decided to give that a try. I’m all for Image #1s, but since I far prefer Image collected volumes, these are–again–"just to try." I’m pretty sure I’ve "let go" on Oblivion Song; I’d tried the first issue, bought the 2nd and maybe the 3rd…but that "maybe the 3rd" and not recalling if I even actually read #2 is enough reason to stop buying. 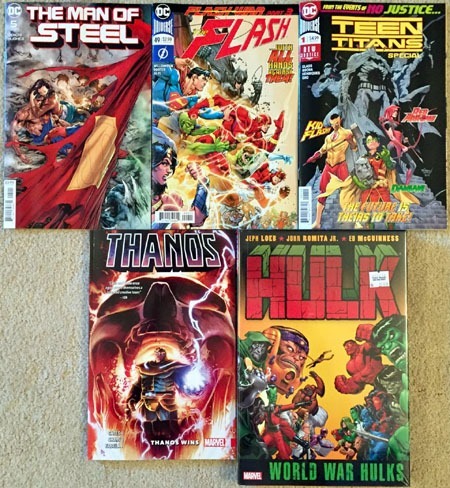 Maybe I’ll get a collected volume, maybe I’ll catch up… but if it didn’t grab me enough to keep up with and such, not something I need to be following in single issues! Both cats–Chloe and Sarah–played photo-bomber when I tried to get the usual photos for this post. 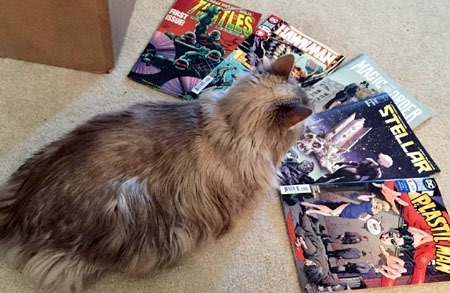 Here’s Chloe checking out the #1s–she was laying on the stack, but let me spread them out for her, and she stayed put for the photo. I know I say it most of the time but…here’s hoping next week is a small one again! 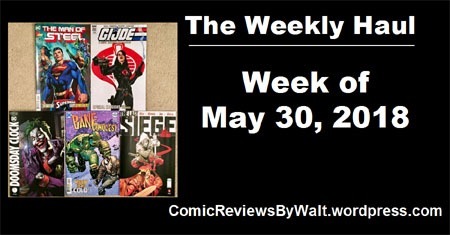 Once again, a decently-small week for new comics! 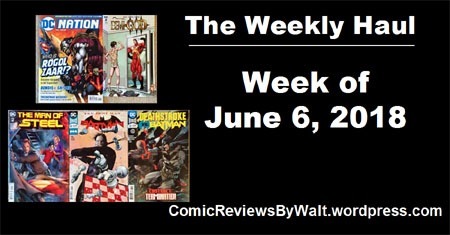 The newest Man of Steel, the new Batman, and because of having already gotten a couple chapters, the newest Deathstroke for the vs. Batman arc. And for the sake of momentary completion since I got the first issue, Demi-God #2. 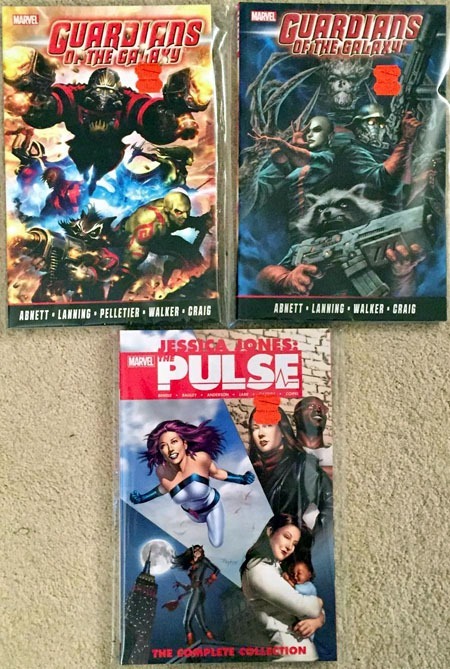 Not sure if this is a mini-series, but not knowing when I’ll get to actually reading #1, didn’t want to then have to hunt for #2…particularly with the likelihood of then being "stuck" with a wrong cover. 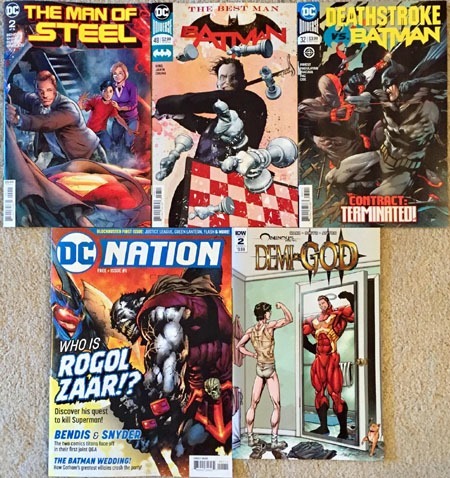 And the "first" issue of DC Nation…which somehow I didn’t realize was going to be magazine-sized, nor what it is. Because of the #0 issue last month, I figured it was at least going to be comic-sized. At least this one’s "free," and I truly don’t have nearly as much room to grouse about that. 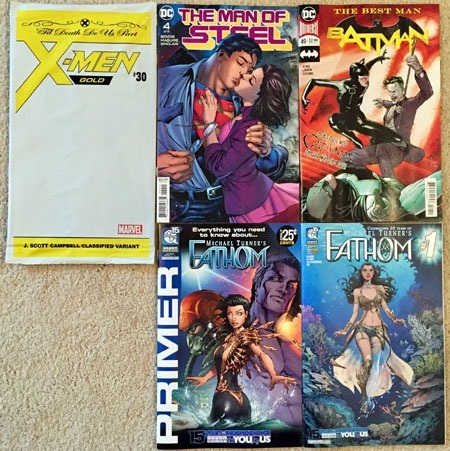 Of course, I’m sure it’s not free to comic shops–they still have to pay for stuff like this. I also bought a print based on one of the covers to 1991’s X-Men #1–the Magneto piece. I’ve already got it in a frame, so getting a proper photo’s not happening right now–either too much shadow or too much glare or too much reflection. Along with the comic-shop run, also stopped by a Walmart for groceries. 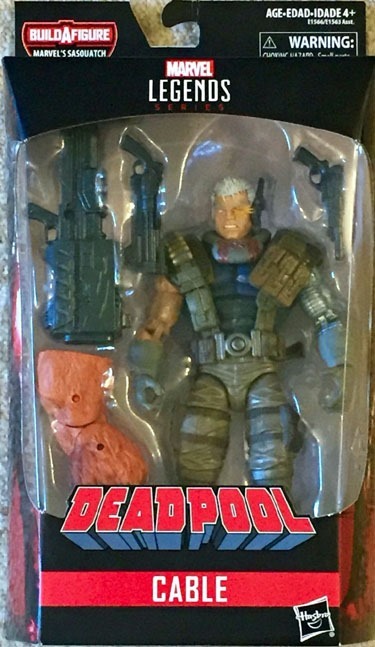 And per usual, took a walk down the toy aisle, figuring I’d start my hunt/quest for finding the Deadpool Wave Cable figure from Marvel Legends. Fellow blogger FigureFanZero reviewed the figure the other day on his blog, and really sold me on it, showing what an awesome piece it is. The figure’s been selling for stupid prices online, and with distribution and all, I figured I’d have to visit numerous Walmart stores–maybe several of them repeatedly–along with Targets to find the thing. I had seen it somewhere in-person before and passed on it, which made it all the more likely that it was going to be a real hassle to find again. And then on the way out of Walmart, spotted this plush Deadpool looking loose and on top in one of those "claw machines." My first try, the claw simply didn’t firm up (stupid machine!) The second time, whatever the machine was programed for, the mechanism of the hook had caught on the loop at the top of the character’s head…such that even when the claw opened again over the delivery chute, the thing was still hanging there. So I paid a third time and the claw immediately dropped it through the chute. 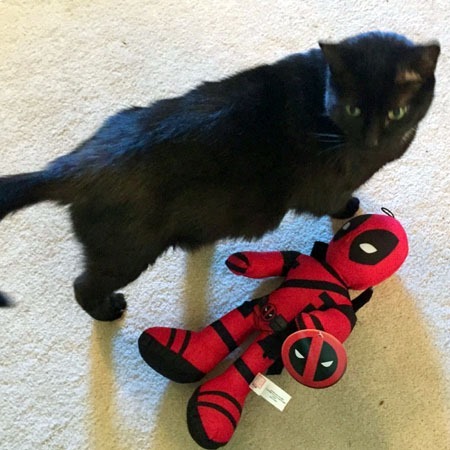 All told, Plush Deadpool was cheaper than a comic book. And quite the cool "prize." I’m sure this would probably be a good $7-10 off the shelf. Much cheaper from the "claw machine." 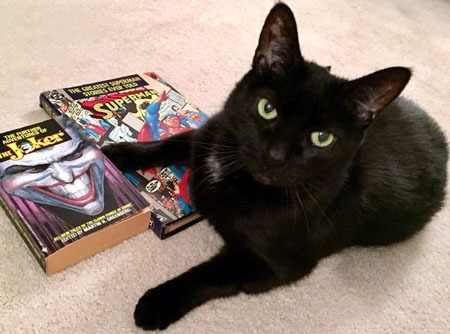 For this photo…one could say he’s been defeated by the black panther…Sarah the Kitty. This is a good point to jump in if you’ve not been following Superman stuff for awhile, and especially if you are a fan of Bendis’ writing. As said above, I’m a Superman guy–so in that regard, I wasn’t going to pass this up. For what this issue and mini-series are…I think it’s well worth picking up…and this six issue "event" seems like it will definitely be cluing us in on what to expect when the ongoing series come back. That said, there’s not really enough to this to "only" get this issue–one pretty much needs to commit to the entire 6 issues. I’m on board, and I’ll be interested in my own thoughts on it once all 6 are out. Full Article posted over at ForgedBy4! 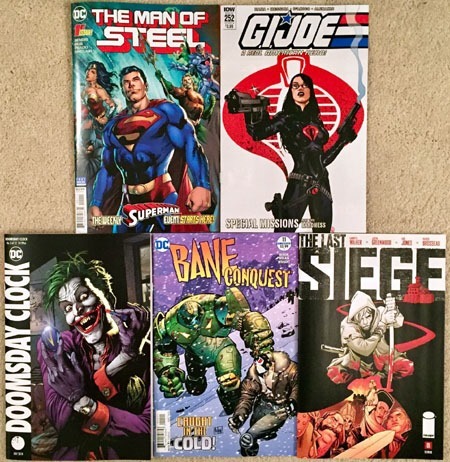 This ended up being another pretty small week for new issues! 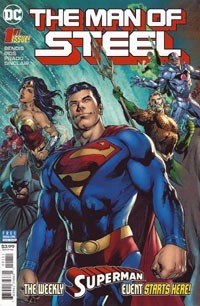 We have the first issue of Bendis‘ The Man of Steel, starting a 6-week 6-issue "event." GI Joe: A Real American Hero #252 is part 2 of the Special Missions arc that apparently is focusing on individual specific characters. We finally have another issue of Doomsday Clock. I very nearly passed on this, but in the HOPES that it actually has the Joker in it, that there’s some sort of dealing with the "three Jokers" thing from Rebirth, I opted to get it after all. I’m not sure if or how late Bane: Conquest is at this point…I don’t remember what I last read, just that I’ve been keeping up with the issues since I had several, to eventually have the full run TO read. I’d forgotten this even existed, though! One more issue to go, though, and I’ll be done. Then, on strength of the writer’s name, I decided to actually try an Image #1 in The Last Siege, despite it being apparently an 8-issue mini-series. Outside of the new issues, I wound up ordering 18-19 issues of Cat & Mouse by Roland Mann from mycomicshop.com. I just backed the Kickstarter for a new Cat & Mouse series’ #1 issue, and on realizing I could get a bunch of classic issues, jumped on that.